Today’s music pick for the 2017 PopCult Gift Guide is a fairly expensive slab of progressive rock awesomeness. FANFARE collects the entire recorded output of pioneering progressive rock titans, Emerson Lake and Palmer, in one huge package that contains a variety of media formats and bonus goodies. This lavishly packaged, super-deluxe, multi-component rigid box set showcases the immense musical talents of Keith Emerson, Greg Lake and Carl Palmer. It contains a wealth of exciting ELP treasure, including: A triple vinyl LP of previously unreleased live audio; All the original album CDs (remastered versions); Previously unreleased live CDs and BBC archive material on CD, 5:1 album mixes audio Blu-ray, complete with all the bonus cuts from earlier remasterings: Two 7” singles: A deluxe hardback photo-book with rare photos and extensive sleeve notes; Reproduced original tour programmes and poster; An enamel ELP pin badge. Each Box will be numbered. Emerson Lake and Palmer produced the most exciting music that the music critic establishment hated. Their dynamic sound, bombastic songs and unparalleled musicianship was too much for the dainty little ears of music journalists used to lame singer/songwriters and boring Hippie jam bands. This is music with more balls than they allow in the Rock and Roll Hall of Fame. FANFARE includes the remastered CD versions of all 11 classic original ELP albums (1970-94), with original sleeve artwork reproduced. It also includes the never released triple vinyl album ‘Live In Italy, May 1973’ in a special gatefold sleeve. There are five previously unreleased CD albums, mastered by the internationally celebrated studio engineering team of Andy Pearce and Matt Wortham. An audio Blu-Ray, containing the stereo 5:1 and surround sound mixes of four of the albums is here, along with two remastered vinyl 7” singles with reproduced original sleeve artwork. In addition Fanfare will also contain a deluxe, hardback 12” book with band photos and extensive notes from acclaimed journalist Chris Welch, featuring quotes from Keith Emerson, Greg Lake & Carl Palmer, a reprinted original 1970 promo poster, 1972 promo brochure, 1974 and 1992 tour programmes and a Metal & Enamel ELP logo pin badge. You may want to check to see if the prog-rocker on your gift list already has most of these albums. Even if they do, chances are they’ll still want it for the remastered editions, book and wealth of unreleased material. 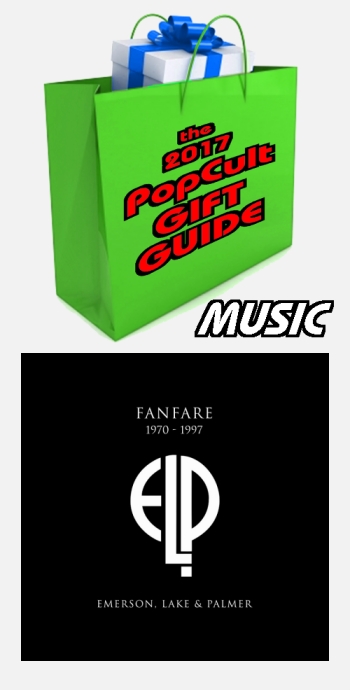 It’s going to set you back nearly two-hundred bucks, which makes it the most expensive entry on the 2017 PopCult Gift Guide, but for just the right person, FANFARE will be worth every penny. You ought to be able to order it from any place that sells huge boxed sets of music, or just go to Amazon.